Buy a Longines watch from Prestige Time and enjoy five-star customer service and discounted prices. Large selection of Longines watches in stock. 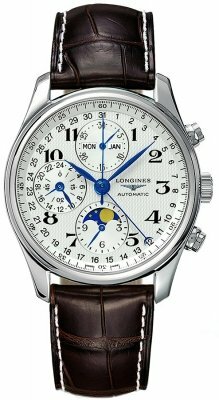 Longines is possibly one of the trendiest brand name watches available today. 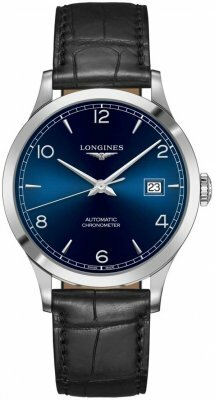 The most popular are the Longines Conquest, Longines HydroConquest and Longines Heritage followed by the Longines Dolce Vita & Longines Master Collection. Other popular series include Longines Classique and Longines Admiral collection. Longines Watches have a history that began when Auguste Agassiz opened his first workshop in St. Imier in 1832, followed by his nephew Ernest Francillon opening the first factory in 1866 on fields at "es Longines". In 1880 the Longines watches brand name was registered and the winged hour glass symbol was born. Since that time Longines watches has enjoyed a very high profile being tied into various Olympic Games as well as being worn by Amelia Earhart the first woman aviator to fly from Newfoundland to Ireland. 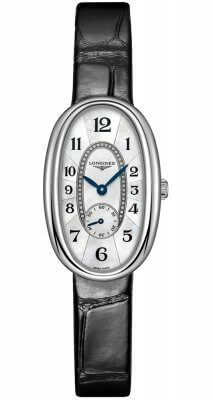 By their 169th Anniversary Longines had sold over 30 Million watches worldwide. 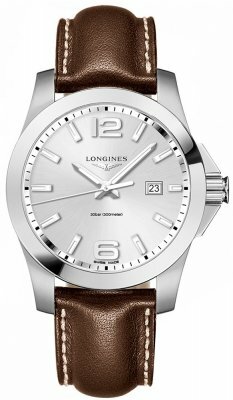 Today Longines offers an across-the-board choice of watches, ranging from sport watches such as the Longines Hydroconquest collection to dress watches such as the Longines Classique, in addition Longines offers some nice entry level complications at very reasonable prices such as the Longines Master and the Evidenza series. The HydroConquest Collection of watches is a sport watch with a rugged look built for daily wear. As can be seen from the name, these watches from Longines are the ultimate in diving performance, with a water resistance up to 300m. 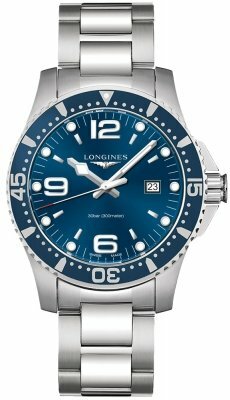 The Longines Hydro-Conquest line includes the Longines HydroConquest Automatic, the Longines HydroConquest Chronograph, and a series of Longines HydroConquest ladies watches. The Longines Conquest Collection of watches is sporty, yet more classy than the Longines HydroConquest, and include the Longines Conquest Automatic available in 2 sizes; 41mm and 39mm, the Longines Conquest Auto Chronograph, the Longines Conquest quartz watch available in mens, ladies, and mini sized. Some of the watches come with a stylish ceramic bezel and integrated ceramic links in the bracelet. The Longines GrandVitesse Collection reflects Longines ties with automobiles and racing. 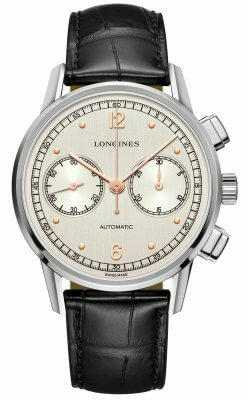 Everything about this Longines series screams out speed and smoothness. This collection features the Longines GrandVitesse Automatic Chrono and the Longines GrandVitesse Chronograph 24 hour which has a GMT 2nd time zone. These watches feature a Tachymeter scale on the bezel for measuring distance over time. The Longines Admiral Collection is a more elegant design with a casual look. The collection consists of the Admiral GMT which has a 2nd time zone with the hours marked on the bezel, the Admiral Automatic Chrono series which is very legible and sharp looking, and finally the Admiral 24 hour dual time with a Tachymeter scale on the bezel. 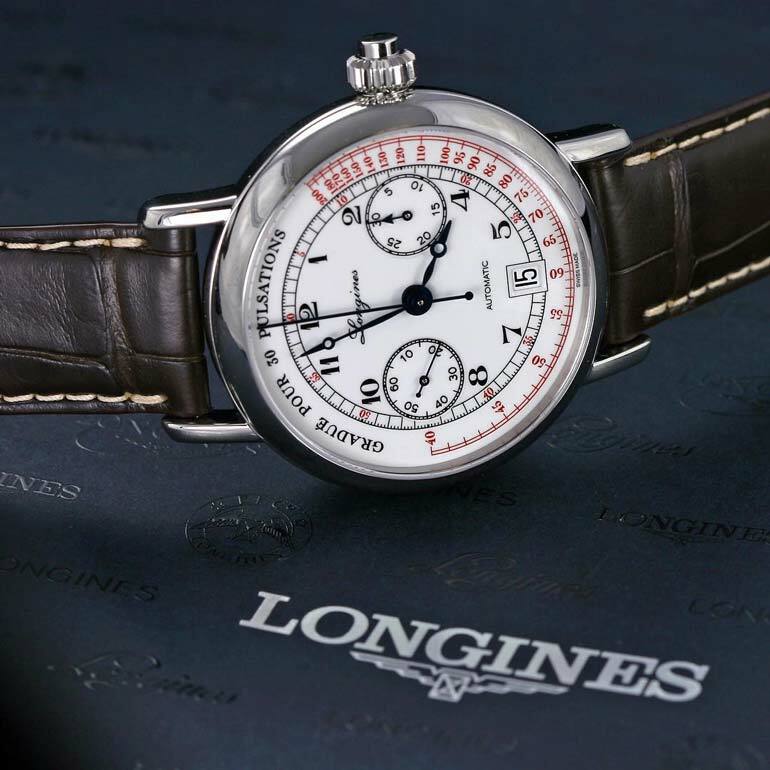 The Longines Heritage Collection of watches are vintage-style watches with an older, more classic look. The Longines Heritage collection includes the Longines Conquest Heritage and the Longines Flagship which are available in steel, yellow gold, and rose gold with both standard automatic and chronographs. The Longines Spirit Collection includes the Longines Spirit Automatic and the Longines Spirit Automatic Chrono with its distinct cushion-shaped case. The Longines Sports Legends Collection is made up of watches that Longines has updated throughout the years. Each one of these watches is tied in with the history of the brand as well as the history of the specific sport it was created for at a specific time in history. The Longines Lindbergh watch, for example was created for the pilot Charles Lindbergh, who was the first to fly non-stop across the North Atlantic. The Longines Weems watch was tied in with an officer in the US navy, and The Longines Legend Diver Automatic watch is a tribute to the brand's commitment to marine exploration. 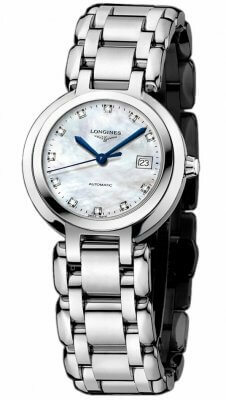 The Longines PrimaLuna Collection is an elegant watch dedicated to the ladies. The Longines PrimaLuna collection pays tribute to the moon (luna means moon in Italian). The Longines PrimaLuna watch line is available with both quartz and automatic movements as well as in various sizes. 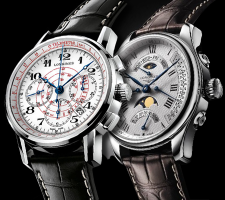 The Longines La Grande Classique Collection is a more traditional style. These watches are made with a sleek and very slim look, keeping with the classic tradition. The Longines La Grande Classique series is available in both an automatic and quartz movement for men and in quartz only for the ladies. These watches are available in various sizes and in various finishes such as all steel or two-tone. The Longines Dolce Vita Collection of watches is a series made in a rectangular shape with a classy design. These watches consist of: Longines DolceVita Quartz Mens, Longines DolceVita Quartz Chrono - Mens, DolceVita Quartz Chrono - Mens XL, Longines DolceVita Ladies Mid-Size, DolceVita Quartz Ladies, DolceVita Quartz Mini. The Longines Master Collection watches are a perfect synthesis of quality and style with watches ranging from entry level automatics to more complicated features such as chronographs, retrogrades, moon phases, and 24 hours. Each watch in the Longines Master Collection has intricate design and texture on the dial. The Longines Master collection includes: Master Automatic XXL - 47.5mm, Master Automatic - 42mm, 38.5mm, 25.5mm, Master Automatic Chronograph 44mm, 40mm, 38.5mm, Master Big Date 40mm, Master GMT, Master 24 Hours, Master Automatic Power Reserve 42mm, 38mm, Longines Master Complications, Longines Master Calendar Diamonds - 36mm, and Longines Master Manual Wind XXL 47.5mm. The Master Retrograde watch collection was created as an anniversary edition and is available in various precious metals. A watch with a retrograde display does not display the function in a circular fashion, as we are used to seeing. Rather, it sets out the functions in a linear manner. Instead of the hands going round in a circle, they travel along an arc, and when they get to the end, they jump back to the beginning. The Retrograde watch collection consists of: Master Retrograde Seconds 41mm, Master Retrograde Seconds 44mm, Master Retrograde Power Reserve 41mm, and Master Retrograde Power Reserve 44mm. 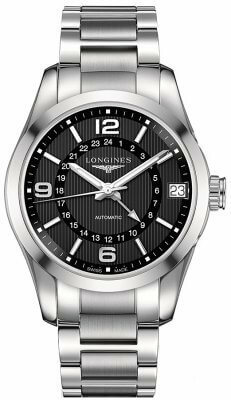 The Longines Elegant Automatic is a collection of classic-designed, self-winding watches with a variety of available sizes from 25.5mm for women to 39mm for men. The Longines Elegant collection offers many models that are available in stainless steel as well as two-tone steel and rose gold plated cases. Also available is the Flagship Collection of watches which are more classy and the Clous de Paris Edition watches which are more sporty yet still remain elegant.